Whether as a matter of circumstance or fate, Charles “Biff ” Hornaday, born in 1923, joined the United States Air Force to serve as a mechanic during World War II. His destiny was affirmed when, because of a shortage of bakers in the service, he continued in the same line of work that he had started at age 8 in a bakery owned by Ralph Storm and Kelley Poe in Mooresville. After the war, Biff returned to the bakery. On Memorial Day 1956, he bought the business and opened his own coffee and donut shop, which he expanded into Biff ’s Pioneer House (Biff ’s), a 24-hour grill and bakery. Though no longer open 24 hours, Biff ’s is still in business today, located at 14 E. Main St. in Mooresville. Before his death at the age of 65, Biff said during an interview with the Reporter Times, “I so enjoyed it (baking). It’s been my life, and it’s been a good life.” He passed that good life down to his children, Larry and Anita Hornaday. Anita moved to Florida. Larry, like his dad, tried to redefine his destiny by serving in the military, but he returned to carry the torch until his death three years ago. Larry’s wife, Alice, who has worked at the restaurant for over 52 years, says Larry had a lot of the same character as his father. Though grumpy at times, he always took care of his employees—and people loved him. He was generous, outgoing, and hard working. He was always there with a hand up for those in need. 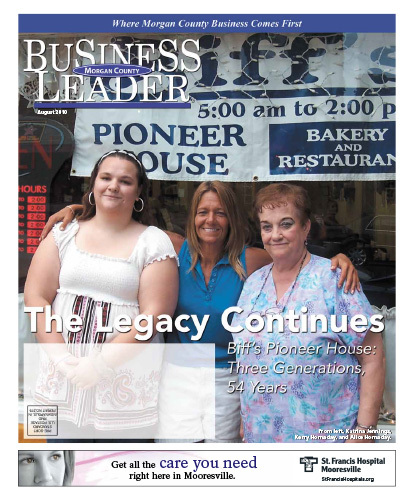 Download the full August 2010 Edition here.